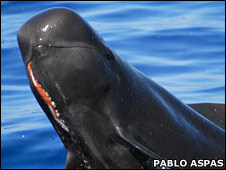 Super-fast pilot whales off the coast of Tenerife have been observed sprinting after prey, likely to include giant squid. The rapid pursuit has brought comparisons with the fleet-footed land predator, the cheetah. The cetaceans even use the same, highly specialised hunting strategy that cheetahs use, scientists report in the Journal of Animal Ecology. They say it gives the lie to our perception that deep sea whales are slow, energy-saving creatures. It is the first time such remarkable behaviour – occurring hundreds of metres underwater, in complete darkness – has been recorded. “As far as we know, no other whale has been recorded to swim nearly as fast at depth,” says marine biologist Natacha Aguilar Soto, of La Laguna University in Tenerife, Spain. Aguilar Soto is a member of an international team of researchers drawn from La Laguna University, Woods Hole Oceanographic Institution in Massachusetts, US, and Aarhus University, Denmark. The team tagged and studied 23 short-finned pilot whales (Globicephala macrorhynchus) living off the coast of the Tenerife, one of only three places in the world that these whales permanently reside. The tags, designed by co-author Mark Johnson of Woods Hole, recorded the speed, depth and direction of the whales’ dives, and also the sounds made and heard by the whales. During the day, the whales are frequently seen lazing on the surface, often in social groups. That led scientists to previously think the whales only hunt at night. But the tags demonstrate the whales also hunt during the day. And when they do, they dive deep, and they dive fast. Tags showed the whales take just 15 minutes to dive to depths of 800m to 1,000m (0.6 mile), and more. And when they pinpoint their prey, the whales surge after it, reaching speeds of nine metres per second, or 32 kilometres per hour (20mph). What’s more, they may keep up the sprint for 200m (650ft), before either catching the prey or giving up the chase. The discovery fundamentally challenges our perceptions of how deep-sea creatures behave, says Aguilar Soto. Until now, researchers assumed that deep-diving whales moved relatively slowly, due to the need to conserve oxygen whilst holding their breath. “It was completely unexpected that short-finned pilot whales sprint at depth with limited oxygen reserves. Cheetahs, for example, more than double their breathing rate during chases,” says Aguilar Soto. So like cheetahs, pilot whales must therefore follow a high-risk, high-gain hunting strategy based on high-speed, energetically expensive sprints. But somehow, the whales do it while still holding their breath. And that may explain why they are spotted lazing on the surface – the whales may be actually recovering from the exertion of the hunt. During the dives, the acoustic tags revealed that the whales switched from slower echolocation clicks to a fast series of clicks, or buzz. That allows them to “see with sound” with greater resolution in the darkness, says co-author Peter Madsen of Aarhus University. “The analogy is like going from snap-shots to video,” he says, indicating the whales are trying to capture prey after the sprints. But “the prey must be large or calorific to reward the deep dives, and they must be able to move rapidly given the top speeds we clocked for the whales,” says Aguilar Soto. One animal fits the bill, the giant squid Architeuthis. “We found a piece of fresh Architeuthis arm floating in the vicinity of diving pilot whales and findings of bitten Architeuthis are common in the area where the whales live,” Aguilar Soto explains. Also, colleague Pablo Aspas recently took a photo of a pilot whale half-breaching with a piece of large squid in its mouth (pic at top). “Its colour and the shape of the cups indicate it may well belong to Architeuthis and the size of the piece indicates that the full length of the tentacle would be more than two metres, corresponding to a squid 4-5 metres long and some 180kg in weight,” says cephalopod expert Angel Guerra of the Institute for Marine Investigations in Vigo, Spain. 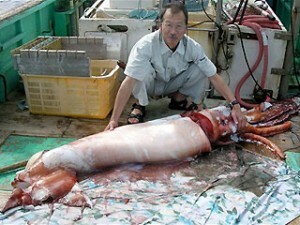 “We have imagined battles between sperm whale and giant squid. But it may turn out that it is pilot whales, one-third the size of sperm whales, which are sprinting for the giant squid!” says Aguilar Soto.